Perfect to mark documents to come back to later. Page markers stay put and lets you re-position as needed. Flag your documents and have room to write notes. Easy to spot and easy to write on. 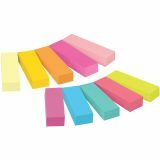 Post-it Page Flag Markers, Assorted Bright Colors, 50 Sheets/Pad, 10 Pads/Pack - Post-it® Page Markers in a variety of colors and sizes are great for color-coding your documents. 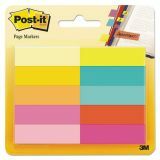 They're especially handy when you want to mark a document, and they stay put until you remove them. Basically, they're part note and part flag—a mixture of the perfect aspects of each.